If you’ve got a cavity, there’s no question about it — it has to be filled. A cavity that remains unfilled for a long period of time can cause real problems. Soon that once small cavity is a severely aching tooth that needs root canal therapy or, at worst, extraction. You must have cavities filled, but you don’t have to have them filled with that noticeable, unattractive silver substance. These days you can choose tooth colored fillings in Virginia Beach for a discreet tooth restoration you won’t even remember you had. Keep reading to learn more about this cosmetic restorative option at Smile By Design! At Smile By Design, your trusted dentists prefer tooth colored fillings over the silver option for a number of reasons. Also known as white, or composite-resin fillings, they work by restoring the health and natural appearance of your original tooth. 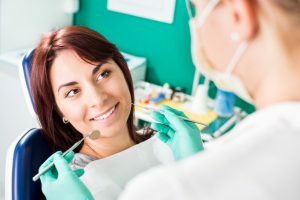 To restore a tooth from decay using a tooth colored filling, your Virginia Beach dentist removes decay from the damaged tooth, then places the white material in the remaining hole and uses a special light to harden the substance. The filling can be shaped to match the contours and curves of your natural tooth, so you’ll never notice the filling is there once the procedure is finished. Patients who choose tooth-colored fillings at Smile By Design consistently confirm that they’re an affordable, natural looking way to solve a variety of tooth problems. If you’re interested in visiting the office that provides patients with options like tooth colored fillings — or if you know you have a cavity and want it repaired without damaging your smile — don’t hesitate to contact Smile by Design in Virginia Beach, VA. Our aim is to keep you and the whole family smiling today, and for years to come.